Water Conditions: New Melones Lake is currently holding 582,745 acre-feet of water. The lake level dropped three feet this past week. It is currently at 874 ft. above sea level and 211 ft. from full. The water clarity is clear in most of the lake with a slight stain in some areas. The water temperature is gradually rising, with the average being 76-81 degrees. There is a two lane concrete ramp with a courtesy dock in place. There will be a courtesy dock on the dirt launch once the lake drops down to that elevation, which is approximately 865' in elevation. Trout: Fair. 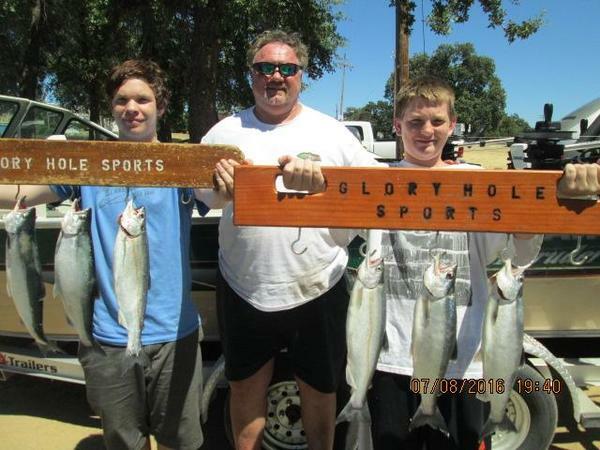 New Melones is kicking out a handful of 2 to 4-pound trout. The trout are holding in the deep/cool areas of the lake. They will remain in these areas throughout the dog days of summer and move shallow once the water begins to cool. The old river channel, the spillway and the dam are all good areas to locate trout. Trolling anglers are catching a few trout and kokanee trolling down to 90' of water. There are portions of the lake that still exceed 200' in depth. Look for these areas to locate both trout and kokanee. Presentations that produce sound and vibration will trigger strikes in water that has low visibility. Try using a Rattle Trap trolled at faster speed to catch some of these larger trout. Night anglers have been doing well fishing under a submersible light. Once again search out deep water and pull the bait and the trout up to the light. Live minnows and nightcrawlers are both good bait choices when fishing under a light. Bank anglers will have more success heading to the lakes and rivers in the high country. We do encourage catch and release for the brown trout as The Department of Fish and Game will no longer be planting them. Carefully measure, weigh and photograph trophy fish and send us pictures and information. 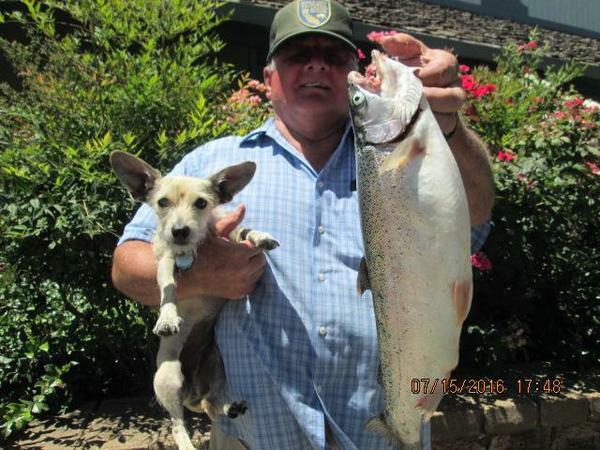 Ken Hopper caught some nice 15" to 18" kokane while trolling between Rose Island and the dam. He targeted 230' of water trolling down 70' to 90'. Pink hoochies w/ silver Vance's Dodger and orange micro hoochie behind a watermelon Simon Wobbler did the trick. Kokanee: Good. The kokanee bite has not been fast and furious but the fish that are being caught are some of the largest in the state. The average kokanee is 16" and we have measured fish up to 19" weighing over 2-pounds. As the water continues to drop and temperatures rise, the kokanee will move to deep water. Try trolling from 80-100' to catch these chunky kokanee. Large dodgers and slingblades have been working well. Try using a Vance's Dodger with a bladed hoochie to create commotion and draw strikes. Also a large slingblade with a slight bend will disrupt the kokanee and they will bite out of aggravation. Presentations that swing or wobble side-to-side will disperse water and be easier for the fish to locate. Apex and wiggle hoochie are both good choices. Before dropping your setup down, hold it near the side of the boat to find the right speed to get ample action. A short leader is recommended on both spinners and hoochie rigs. Scent is also very important and should be applied throughout the day. Stop by and pick up some dyed and scented corn on your way to the lake. Bass: Fair. The water level continues to drop making the bass bite a little tougher. Most of the fish have pulled off the shoreline and are holding on deep water structure. During the summer heat it is best to fish early in the morning or late in the evening. The key to catching a handful of bass is locating the bait. The schools of shad will be in deep/cool water. The bass will be actively feeding and then shut off immediately. Catch them when they are in a feeding frenzy and then move once the bite dies and try to locate another productive area. Reaction baits and small swimbaits work well to find fish. Try using a small crankbait or an underspin fished through the bait. Switch to a small shad patterned worm on a dropshot to catch the fish that are not willing to chase. Some fish will stay near shallow water and feed on crawdads. A football jig is always a good choice. Or a bulky creature style soft plastic fished on a Wrecking Ball head will trigger strikes. PLEASE PRACTICE CATCH AND RELEASE. Take photos and carefully release the fish back into to the lake to maintain a healthy fish population for generations to come. Glory Hole Sports Big Fish of the Week goes to Trena John. 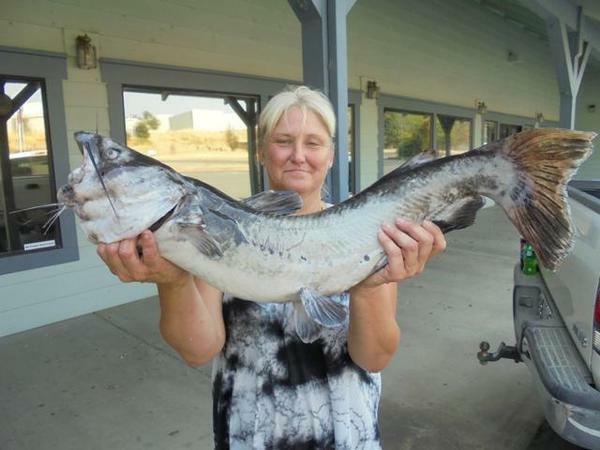 She caught a nice 9-pound, 13-ounce catfish on chicken liver. Catfish: Good. The catfish bite is picking up and many anglers are catching 6 to 10-pound fish. The cats will feed all day, but the best bite time is mornings, evenings and during the night. Try using frozen shad, anchovy or mackerel to coax them into biting. The catfish in New Melones will feed on shad and small sunfish just like a bass would. It is best to have a two pole stamp and give the fish multiple offerings. Try fishing a large chunk of frozen fish on one rod and fishing a single crawler/mallow combo on the other. Each year some of the largest fish are caught on small offerings. Ken Ratihn caught a large 7.11-pound catfish while soaking Power Bait upriver. Jeremy Clinkenbeard and David Homath of Sonora caught a whole bunch of crappie while fishing mini jigs during the day. Their biggest weighed 2-pounds and was caught in 15' to 20' of water. Crappie: Good. The crappie are biting and can be caught during the day or at night under a submersible light. The crappie are holding in main lake pockets, coves and creek channels. Try fishing near standing timber and brush to locate the schools of crappie. A live minnow fished under a slip-float is a great way to catch them. Also try using small swimbaits, Beetle Spins and artificial minnow to catch them.